Buy the best beef, pork, lamb, duck, chicken, foie gras, charcuterie, and truffles online. Naturally raised. Antibiotic and hormone free. Spring Freezer Sale: For a limited time, enjoy 40% Off more than 90 frozen favorites (while supplies last) at D'Artagnan. Valid 4/18-4/23. Think Spring and Save - 10% Off Orders $100+ with code 10DEAL. Valid now through 5/31! Think Spring and Save - 10% Off Orders $100+ with code 10DEAL. Valid now through 5/31! TERMS: Promotion cannot be combined with other offers. Not valid during flash sales. Not valid on Japanese Wagyu beef, fresh truffles, fresh turkeys, fresh turkey breasts, fresh geese, or fresh capon. Think Spring and Save - 15% Off Orders $150+ with code DEAL15. Valid now through 5/31! Think Spring and Save - 10% Off Orders $100+ with code DEAL10. Valid now through 5/31! Think Spring and Save - $5 Off Orders $50+ with code DEAL5. Valid now through 5/31! Think Spring and Save - 25% Off Orders $200+ with code DEAL25. Valid now through 5/31! Think Spring and Save - 25% Off Orders $200+ with code DEAL25. Valid now through 5/31! TERMS: Promotion cannot be combined with other offers. Not valid during flash sales. Not valid on Japanese Wagyu beef, fresh truffles, fresh turkeys, fresh turkey breasts, fresh geese, or fresh capon. Think Spring and Save - 15% Off Orders $150+ with code DEAL15. Valid now through 5/31! TERMS: Promotion cannot be combined with other offers. Not valid during flash sales. Not valid on Japanese Wagyu beef, fresh truffles, fresh turkeys, fresh turkey breasts, fresh geese, or fresh capon. Get $20 Off $150+ when you sign up for the newsletter at D'Artagnan! Make Gift Giving Easy & Enjoyable with a Gift from D'Artagnan! Make Gift Giving Easy & Enjoyable with a Big Bacon Burger Recipe Kit from D'Artagnan! Make Gift Giving Easy & Enjoyable with a Ultimate Wagyu Burger Recipe Kit from D'Artagnan! Make Gift Giving Easy & Enjoyable with a Charcuterie Gift Box for 4 from D'Artagnan! Make Gift Giving Easy & Enjoyable with a Charcuterie Gift Box for 8 from D'Artagnan! Make Gift Giving Easy & Enjoyable with a Charcuterie Gift Box for 12 from D'Artagnan! Make Gift Giving Easy & Enjoyable with a Cassoulet Recipe Kit from D'Artagnan! Make Gift Giving Easy & Enjoyable with a Deluxe Foie Gras Gift Box from D'Artagnan! Make Gift Giving Easy & Enjoyable with a Deluxe Duck Gift Box from D'Artagnan! Make Gift Giving Easy & Enjoyable with a Duck Magret & Confit Gift Box from D'Artagnan! Shop D'Artagnan Gifts $150 or Less! 100% Corn Fed, Grade A. Order Today from D'Artagnan. Make Your Dinner Delicious! Shop for Gourmet Meats & Foods at D'Artagnan. Gourmet Poultry and Game Birds: Duck, Chicken, Turkey, Pheasant, Squab, Quail and more. Buy now from D'Artagnan. Gourmet French Pates & Terrines. Order today from D'Artagnan. The Source for Charcuterie: all-natural, hand-crafted cured and smoked meats. Shop at D'Artagnan! Gourmet Sausages: Saucisson Sec, Andouille, Chorizo and more. Shop Now at D'Artagnan! Truffles, Truffle Butter, Truffle Oil, Fresh and Dried Mushrooms. Shop at D'Artagnan Today! Perfect Meals Made Simple: Order Gourmet Recipe Kits from D'Artagnan Today! Wagyu and Gourmet Beef: Steaks, Roasts, Burgers and more. Grass-Fed, Pasture Raised from D'Artagnan. Gourmet, Humanely-Raised Heritage Pork: Chops, Hams, Bacons, Ribs and more from D'Artagnan. Shop Today! Gourmet Food at D'Artagnan: Free-range, organic, heritage meats and preservative-free charcuterie. Shop Now! Gourmet Beef, Pork, Poultry, Duck, Game Meats, Mushrooms and More. Fresh and Natural from D'Artagnan. Shop Now! All-Natural Organic Free-Range Chicken. No antiobiotics. No hormones. Order from D'Artagnan. D'Artagnan Online Gift Certificates: A Delicious Gift for the Gourmet in Your Life. USDA Certified Organic Free-Range Turkey. No antibitics. No hormones. Shop Now at D'Artagnan. For Foodies: Gourmet Gift Baskets, Recipe Kits and more at D'Artagnan. Shop Now! Check Out This Great Deluxe Charcuterie Gift Box at D'Artagnan! Check Out This Great Grande Charcuterie Gift Box at D'Artagnan! Check Out This Great Supreme Charcuterie Gift Box at D'Artagnan! Check Out This Great Cassoulet Recipe Kit at D'Artagnan! Check Out This Great Angus Beef Steak Lover's Gift Box at D'Artagnan! Check Out This Great Angus Beef Ribeye Lover's Gift Box at D'Artagnan! Check Out This Great The Ultimate Wagyu Burger Recipe Kit at D'Artagnan! Check Out This Great Deluxe Duck Gift Box at D'Artagnan! Check Out This Great Duck Magret & Confit Gift Box at D'Artagnan! Check Out This Great Deluxe Foie Gras Gift Box at D'Artagnan! Gift Certificates at D'Artagnan - Perfect For Every Occasion! 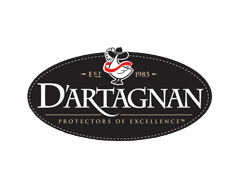 These D'Artagnan coupon codes have expired but may still work. Anniversary Free Shipping Event! Free Shipping on orders over $150 at D'Artagnan! Offer Valid 3/21-4/3. Shop Now! Flash Sale! 40% OFF at D'Artagnan! Offer Valid 3/20 only. Shop Now! 12-Hour Flash Sale! 40% OFF 125+ D'Artagnan Products. 9am-9pm 3/20 Only. Shop While Supplies Last! 12-Hour Flash Sale! 40% OFF 125+ DArtagnan Products. 9am-9pm 3/20 Only. Shop While Supplies Last! 15% OFF Beef, Veal, Pork, Lamb at D'Artagnan! Offer Valid 3/11-3/19. Shop Now! 30% Off Freezer Sale! Offer Valid 3/4 - 3/10. 20% OFF Seasonal Picks at D'Artagnan! Offer Valid 2/19-3/3. Shop Now! President's Day Free Shipping Event! Free Shipping on orders over $150 at D'Artagnan! Offer Valid 2/14-2/18. Shop Now! Flash Sale! 40% OFF at D'Artagnan! Offer Valid 2/13 only. Shop Now! 15% OFF VENISON at D'Artagnan! Offer Valid 2/7-2/12. Shop Now! $25 Off Orders $200+ at D'Artagnan! Use Code DEAL25 to Redeem Now Through 3/31! $25 Off Orders $200+ at D'Artagnan! Use Code DEAL25 to Redeem Now Through 3/31! TERMS: Promotion cannot be combined with other offers. Not valid during flash sales. Not valid on Japanese Wagyu beef, fresh truffles, fresh turkeys, fresh turkey breasts, fresh geese, or fresh capon. $15 Off Orders $150+ at D'Artagnan! Use Code DEAL15 to Redeem Now Through 3/31! $10 Off Orders $100+ at D'Artagnan! Use Code DEAL10 to Redeem Now Through 3/31! $5 Off Orders $50+ at D'Artagnan! Use Code DEAL5 to Redeem Now Through 3/31! 15% OFF Valentine's Day Assortment at D'Artagnan! Offer Valid 2/1-2/12. Shop Now!